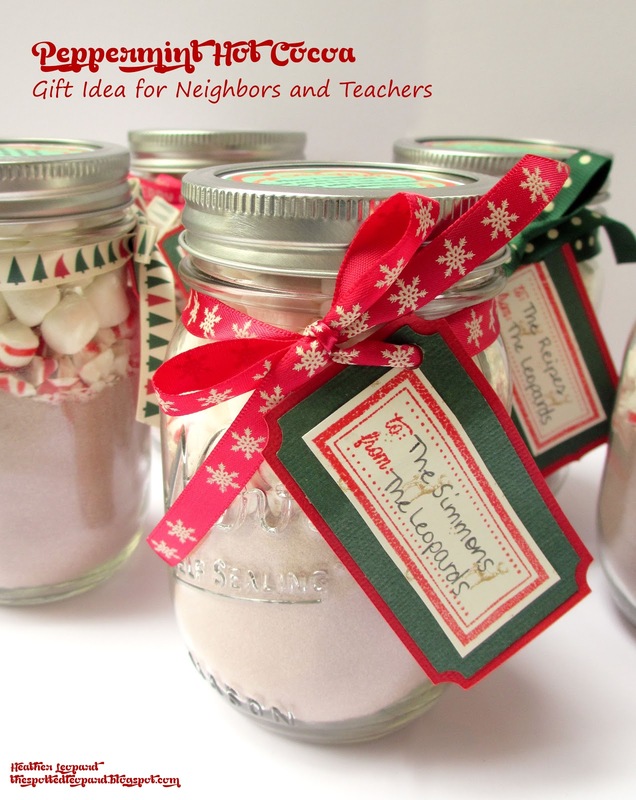 I made these yummy peppermint cocoa gifts to give as neighbor gifts and/or teacher gifts (as well as some of the staff at my daughter's preschool). I gave these for Christmas but I was thinking about how great these would be as a "winter" gift because it certainly stays cold for several months and who doesn't love a bit of peppermint/chocolate in their tummies to warm them up when it's cold!?! 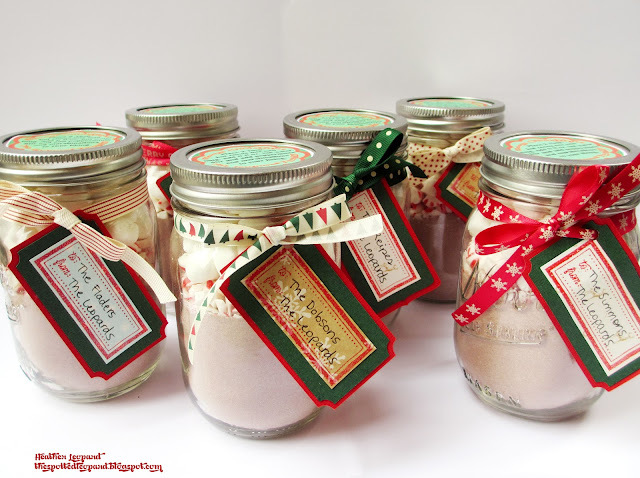 These are relatively inexpensive and very quick and easy to make. Purchase a large 27 oz. canister of Nestle hot cocoa from Target. You could make your cocoa from scratch but I wanted to make this quicker and easier! Pull out your favorite Christmas or Winter ribbons and papers. Add a layer of peppermint. I used more than I expected since they are heavier than the cocoa mix and the bottom layer kind of sunk into the cocoa. Lastly, add a layer of marshmallows. I packed them in because I know how much kids love marshmallows! I created an instruction label document in Photoshop, which you can DOWNLOAD HERE. Just load it into Photoshop, if you have it and change the name! If you don'w have PS, I will try to create a PDF version and will post if soon. I cut a larger tag out of red cardstock and then cut a smaller tag our of green and adhered it over the red. I used my American Crafts Kringle & Co stamp to stamp the to/from frame over different kinds of pattern paper. I'm a variety, no two gifts the same type of gal. :) Plus, it's a great way to use up scraps. 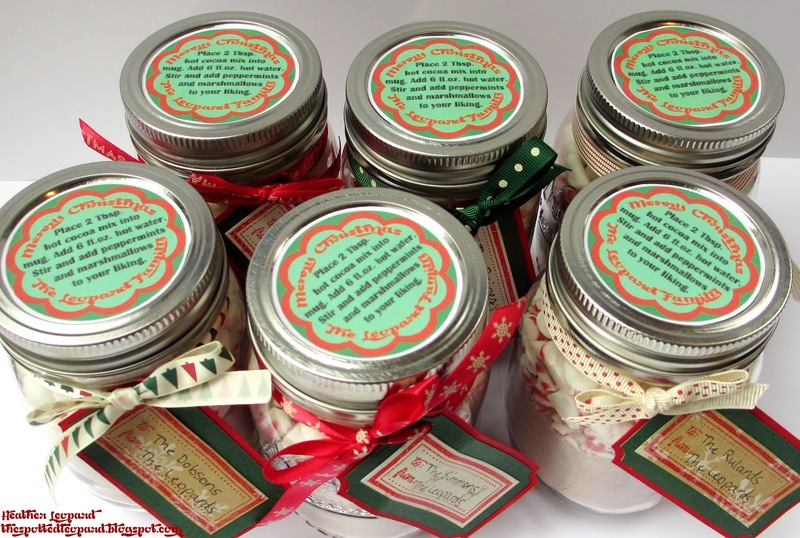 I tied ribbon (also from American Crafts) through the tags and around the jars. The kids and I really enjoyed delivering them to the neighbors and school staff. I only hope they enjoyed the cocoa as much as we loved making it for them! what a SUPER cute and CLEVER idea Heather! Really very nice gift.love it.